While I like to see myself as well-read, there are still some significant holes in the foundation of my reading (at least to any great extent) of these predecessors—Gertrude Stein, Ezra Pound, and Robert Creeley, to name a few. These writers, along with John Ashbery and Robert Hass (again, to only name a few) are among those that I either have or will question and/or challenge when I first turn to their work. 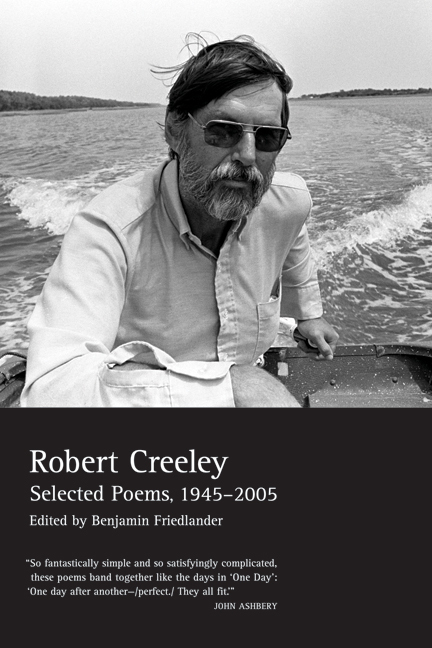 When I sat down with Robert Creeley’s Selected Poems, 1945-2005, this afternoon, I went in only having read a few poems previously, knowing a lot of opinions about the writer’s work and feeling skeptical about whether or not his work would meet the demands of all the praise. In a word, no—I was not disappointed. Referring first to the title of my blog post, Robert Creeley’s work offers many lessons to his readers who are also writers; and these lessons are written well enough to be taken note of and are subtle enough to be ignored (if the reader so wishes). Beyond simply admiring the wide range in Creeley’s writing style and topic choices, I admired the ways in which he described the Body and, oddly enough, the Weather, as well as his meta-critiques of language, and even built-in lessons on such writing provisions as enjambment. In looking specifically at Creeley’s exploration of the body and of weather (or natural conditions, to expand the view), his stance on the relationship between the body and nature, or humankind and nature, becomes clear: they are interconnected. In looking at a poem such as this, the initial explanation may be a simple listing of male familial figures; however, ending on a note of nature’s sheer size and endlessness, the relationship between the narrator becomes, both, violent and seemingly hopeless. Using nature’s conditions as a means to describe and complicate the layers of relationships seems to be one of Creeley’s many talents, and though this first Selected compiles poems from a series of sixteen individual poetry collections, this method of relating the body with nature is not exhausted. why should the writer, in a sense, point out that he is making these decisions? Perhaps in a poem such as this one, the intent could be used as a means to suggest motion to the reader, in a sort of step-by-step form. Then again, it also provides the reader with a reminder of the importance of line breaks and enjambment, despite whatever Creeley’s intent might have been.